Jon Meacham has written biographies of American presidents. He has also written two books dealing with the intersection of Faith and the American political tradition. 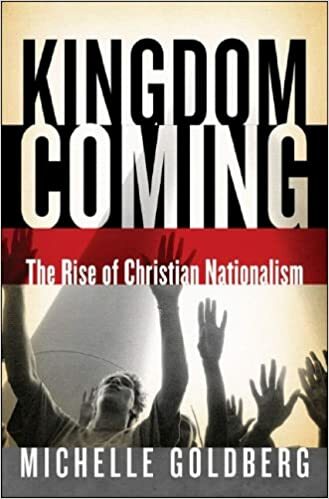 Meacham is not a Christian nationalist; he is not about imposing Christianity or excluding other traditions. But he does see our political tradition as having roots and values of the Judaeo-Christian tradition at our core. The “American soul” has been able to embrace (at least to some degree) many different traditions. The KKK has thrived at one point in American history; there were many Congressional representatives, Senators, judges, and governors; the KKK proudly marched publicly in many cities and towns, including Washington, D.C. The American soul has also embrace the civil rights movement and the vision of Dr. Martin Luther King, Jr. He points out that people often ask, “Has it ever been this bad in the United States before?” They look at the divisiveness, crude language, ridiculing one’s opponents, Congress’ inability to get anything done, etc. Meacham says, “Yes, it has been worse….We had a Civil War; we have had rioting in the streets, and so forth. And yet got through it.” But he wants to be very clear. We must not be complacent. It’s not that things will just get better. We have to look at our problems, seek out solutions, talk with one another, and then sacrifice to make things better. I am reminded of Scott Peck’s book on community , A Different Drummer. Very often groups will see it’s necessary to change, but they expect that it will be other people who change and adapt; they expect to remain exactly the same. It’s only when they realize that the entire community or organization may collapse that they themselves change. We can make things better, but we will have to work and sacrifice to do it. It won’t just happen by itself. It seems like every history teacher I ever had always started the course by saying, “History is not about names and dates; it’s about understanding why things happen.” Then, of course, they gave us tests about names and dates. history are really more important than specific people or times, places, and dates. Should the government at some level provide education? Schools with grades K–12? Have a role in public health? Should the government have a say about cleanliness in public restaurants? All these–and more–involve some intrusion in some people’s lives, including the people who pay taxes to support them. 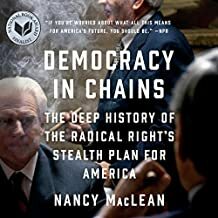 Democracy in Chains is an explanation of a plan to build support to remove such government programs. There are two elements to their position: 1. The government should not have a role in the free market; their theory is that the free market self-corrects and provides the greatest good for the greatest number. 2. Some people have to pay more taxes to support such programs. For example, there are people who have no children in public school, but they must pay school property taxes. This book is how people are interested in, not only who rules (who wins elections), but also in changing the rules (changing how we approach such services). They plan to limit the number of voters, the role of collective groups (unions, voluntary associations like A.A.R.P. ), limit the power of local control, reduce consumer rights (by “agreeing to terms of service” you give up the right to sue and to agree to arbitration). The goal is to replace\eliminate Social Security and Medicare with privatized plans. An interesting and relevant topic. It helps give a frame through which to see current politics. The Judaeo–Christian tradition has had an influence on American political thought from the very beginning. However, Americans have tried to keep any single denomination or tradition from having any advantages or disadvantages over another or any perspective of faith, including atheism. 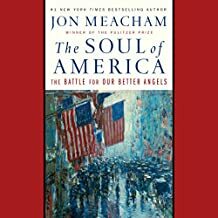 Jon Meacham’s The Soul of America: The Battle for Our Better Angels and his American Gospel: God, the Founding Fathers, and the Making of a Nation give a much clearer and detailed description of the role and importance of religion in our nation’s founding. However, Michelle Goldberg’s book points to a disturbing strand of current American religious and political thought, usually found on the religious and political right. Christian nationalism is the mistaken historical notion that the Founding Fathers intended that the U.S. would be a Christian nation. The Bible and “God’s law” would be the guiding principles. Those things which are sinful should also be illegal and punished as crimes. Of course, the founders were very familiar with the Bible (and the Greek and Roman classics), but they did not see the U.S. as a “Christian nation.” Thomas Jefferson did not believe Jesus was born of a virgin, was God, or rose from the dead. In fact, he wrote his own New Testament, taking out all of the miracles. He did like most of the moral guidance. The perspective of these evangelicals includes Christian dominionism. God gave Adam and Eve dominion over the earth. Most major denominations–including Catholicism–understand this to mean that humanity does not own the earth outright. Rather, the earth is for the benefit of all people, and we are to use it in the name of the Lord, the dominus.” We are stewards, not owners. We will give God an accounting of our use of the earth. The people of whom Goldberg is writing have a different perspective. They believe that the gift of dominion of the earth was lost with original sin. It is given back with baptism. Therefore, Christians (and not those other people, whoever they are) should rule the world. This perspective has many implications: creationism vs. evolution in public schools, sexual ethics and morality, public funding of social and religious programs, and so forth. History and theology make a difference! We need to have a clear understanding of what we are about. I have heard people says: “Mexico is poor because it is rich.” At first that sounds like a contradiction, but it really includes a basic truth. Most of Latin Amerca was explored and conquered as a way of extracting the wealth in the soil: gold and silver. The political and economic structures were set up to do just that. The goal was to extract the wealth for the benefit of the “mother country.” The people in those lands were either an obstacle or a means to extracting that wealth. For a long time, the colonies were forbidden to manufacture things. They had to export the raw materials, and then buy them back as manufactured goods. 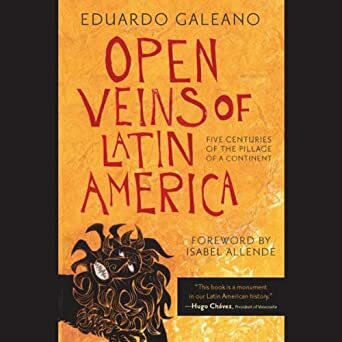 As time progressed, political ties were severed with the “mother countries,” but the economic structures and systems remained very much the same, and the economy continued to be extractive. The mining that continued, not just silver and gold, but tin, copper, and iron, all followed the pattern that they were taken for the benefit of others, not the local people. The agriculture and manufacturing that eventually developed were also set up in a way that benefited and profited a few people at the top of society and people outside the country. For example, auto manufacturing paid workers a very small wage, but the cars cost three times the American price in Latin America. The thirteen British colonies did not have the gold and silver. They had some raw materials to be exported, and they were exported. But the colonies were able to maintain some control over their own economy. They began to build their own ships, for instance. Eventually, they rejected British control and taxation. They kept the economy from being extractive. The book is very long and detailed. It covers the history from the beginning up to the present. I recommend it, although it can feel like a slow read with all the details. 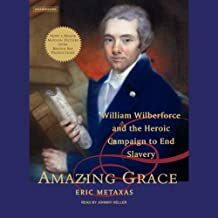 Despite his impact on western civilization, William Wilberforce is often forgotten. If remembered it is merely for his impact on ending slavery. But there is much more to the man and his story. He began (what we would call college) as a life of insouciance. He attended class, but with little seriousness. There was lots of time for “discussion” with his friends and the life of a gentleman. After finishing at school, he had some money, and so we bought a seat in Parliament. Buying is the appropriate word because voters were expected to be paid for their inconvenience. In addition, he held an ox roast: a very rare and expensive event, but it all paid off in terms of getting him elected. The “Great Change” (as he called it), took place on a trip. He had asked Isaac Milner, an Anglican priest who had been his childhood tutor, along on the trip. Milner was ordained, but like many clergy of his day, did not appear to be very fervent. However, as the two of them discussed issues, it became a serious discussion. Wilberforce had a great conversion. He seriously considered leaving politics altogether, but was persuaded to remain. His Christian belief challenged him to believe that certain things followed from his faith, and one of them was that slavery was wrong. His faith was serious and profound. In fact, he kept lists of people and marked their names with suggestions as to how he could either convince them to faith or at least nudge them along the way. His campaign to end slavery took a long time. It was seriously believed by most people that slavery was simply a necessary evil that was needed to maintain civilization. Without this “free labor” the economy would simply not function. Slavery was thought to be part of the human condition. The men’s group at St. Michael is reading this, and it is well worth the read! 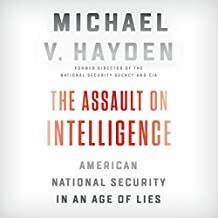 Michael Hayden is a former director of the C.I.A. He is currently retired. The central person he focuses on is President Trump. But he is very clear that President Trump is not the cause of this phenomenon; he is the result of it. He provides examples of how it works, but it really is much deeper in our society and social discourse that the president. While he critiques the president, he seems to try to be fair and respectful. An example would be the issue of the FBI “embedding” some one in his campaign. When pressed for facts, Mr. Trump responds with, “A lot of people agree with me,” or “Just look at the basics.” He doesn’t have a name or a circumstance of how this happened. By now means is Mr. Hayden “playing politics.” He is a career military and intelligence officers. He has given his life in the service of providing the most accurate information possible for the political and military leaders of the U.S. His concern is that when leadership (and not just Mr. Trump) do not listen to facts and data, we can have a serious problem. Democracy requires open discussion of the facts. We need freedom of speech, not just to let people share their opinions, but also to debate information so that we can arrive at the best solutions based on the most accurate facts. Our political debates have degenerated into opinions and feelings without reference to facts. Francisco Cantú in The Line Becomes a River points out, for instance, that in all the talk about building a wall, we forget that we have already built on. In the early 2000’s, Congress authorized and President Bush built approximately 700 miles of wall along the U.S.–Mexican border (the other miles are mountain and desert). No one, pro-wall or anti-wall, makes reference to it. Our communities and nation need clear facts and open debate. The common good is not served by half-truths or only feelings. Facts matter. Last Thursday Fr. David in his homily said that we have blindspots. We have them when we drive a car; there is a spot we cannot see. The rich man (Dives) in the parable, he had a blind spot for Lazarus. He saw him–he later mentions his name–but he never really “saw” him. He ignored him. The same is true of how we treat the DACA people, the Dreamers, and the undocumented in general. We quickly remember that they are here without authorization. That one quality becomes the one thing we see. It’s the one thing we use to define who they are. It is the measure with which we judge them and how we treat them. They are a major part of the workforce that works the fields where food is grown. They help harvest the crops. They work in the dairies where we get our milk. They work in slaughterhouses and poultry plants. They work in restaurant kitchens where we eat. They work in the construction business that builds our homes. They take care of our children. We all benefit greatly from the work they do. They make our homes cheaper. They provide much of our food. They literally put some of the food on our plates. They wash the plates when we’re done. They are mothers and fathers. They are families. They are people who make our lives comfortable, and they have been doing it for about twenty years. And they have been doing it living in fear. Children comes to school, not certain their parents will be there when they return. Parents go to work, not certain they will make it home. Parents have been stopped, handcuffed and taken from their children. Yes, they broke a law. But they pay a very high price every day. They work cheaply and live in constant fear. And we have a much better lifestyle because of it. We shouldn’t define them only because of a legal violation. We can have a process where we “screen” them and help them gain status. We can fix it.